The purpose of my runs has officially changed from my leisurely (but pretty consistent) running for my sanity to training for a race. This morning I registered for a half on Labor Day. I'm a little worried about the potential heat and humidity (never know what to expect in the Midwest) and that we'll be in Lithuania for 10 days 2 weeks prior to the race, but I decided to go for it anyways. Since this is my first half marathon, my goal is simply to finish it. I've taken (been forced to take:)) Miss Zippy's advice, and started my runs a little later than normal. 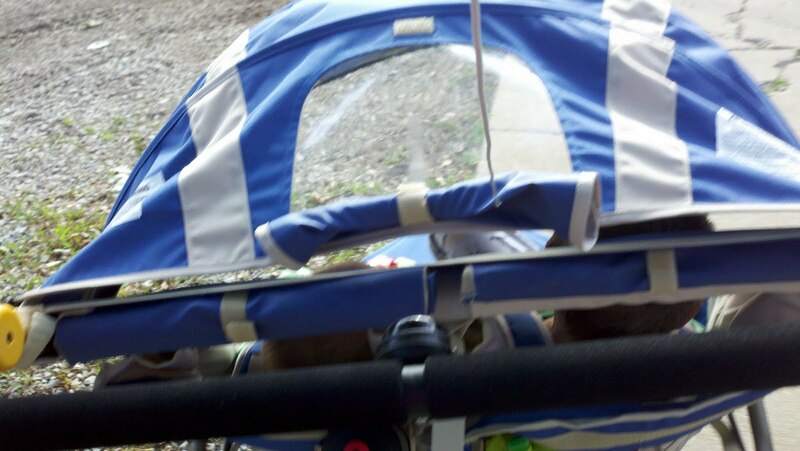 My options this summer are to run early alone on the treadmill, or outside pushing the double stroller (thanks K!) with the other two on bikes. I've opted for the latter this week and although it's been more difficult, I've really enjoyed it, plus it's getting me better prepared for my race. With a little grumbling, we've managed to get out the door by 7:30. Last week we did a Rokit Fuel tasting. The family consensus - super delicious and nutritious! Check out our reviews and enter the giveaway through July 17 - here and at Midwest Multisport Life! Have a great weekend! It's going to be HOT! How do you plan to stay cool? Wow, you are amazing! Out the door by 7:30 with kids?? Again, amazing. And so good for the kids. And you. Hey, your training isn't taking away from your family. That means you can go hide in a corner and read or something later without feeling guilty about it. Good luck with the half. I'm doing one in October and my training has yet to kick in bc I've managed to semi injure myself (tripping on the way to the bathroom) and then give myself a new excuse by falling on my bike (actually falling OFF my bike). That's suppose to be a good half! Under the shade through the preserve. Hoping for cool weather that day for you! Awesome Laima! And thanks for the shout-out. Not putting any pressure on yourself time-wise is smart too. I'm coming up from TN to run that one. It would be fun to meet! I'm very impressed you are going out the door with the double stroller. I struggled to push my friend's through a fast food restaurant. I cannot imagine going any real distance with it. I did that half in its inaugural year! It went off late and was HOT and a little hilly. BUT most of those hills are on shaded trails so not too bad. Have fun!